The Ultimate Blog Party is being hosted by 5 minutes for mom. I’m being fashionably late as this party started on 7 March and it’s now 13 March. Normally I like to be on time but other events sometimes get in the way. The truth is I’ve been too damn busy partying to host a party of my own. And it’s too hot to organise and host a party anyway. 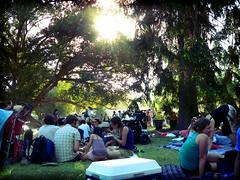 My party this week, which I didn’t organise or host, was on Sunday at Womadelaide. Womadelaide has been a staple of mine for the last 13 years or so. Back in 1995 and maybe for the next two Womad’s after that I bought a weekend pass, but back then I was a bit younger and I was childfree so it was a lot easier and a lot different. This time, I bought a day/night ticket for about the same amount as I paid those 13 years ago for a weekend pass. Finances aside, I love Womad. The atmosphere is really embracing and friendly and it’s perfect for a family outing. This year it was really hot and oh so dusty. It’s the dustiest it’s ever been and the dust really affects me. It affected others too because I saw a lot of people using dust masks and others had scarves around their face. I had a hayfever tablet which did nothing and went through a lot of tissues. The setting for Womadelaide is perfect though, in Botanic Park which is inundated with huge trees creating plenty of shade. We had a good shady spot near one of the smaller stages but close enough to Stage 1 to hear the main acts. This year was a case of hearing a lot more music rather than seeing it. You could argue that I could just buy the best of CD but CDs don’t come with an atmosphere plugin. JJ loved it. He wasn’t too keen to go initially because of the heat but after we’d seen Black Grace (a fabulous NZ dance act) and were walking back to base camp he announced that he was having the best fun EVER. And I must say that he was amazing. The worst thing he did was nag me to go to the mist tents and could he please have an icecream now? I am used to tuning out a lot of these requests so it didn’t bother me too much. Another thing I love about Womad that takes place outside of the music on the stages is the roving performances and the art that’s created at the workshops. 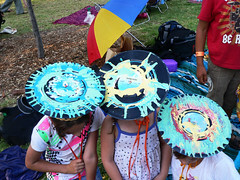 You can see my other Womadelaide photos. You can also read what I’ve written about Womadelaide 2007, Womadelaide 2005 part 1 and Womadelaide 2005 part 2. So this Womadelaide thing was only one day since 7 March, but I had Monday to recover (thank goodness for long weekends) and I’ve been at work ever since. But I think Womadelaide is enough of a party and feast for the senses for you all. I’m inviting you to party with me! What am I doing in Australia? I married an Aussie…and moved to Brisbane, leaving my family and friends and all the right-side-of-the-road drivers in America. Better late than never, they say. How fun! Welcome to the blog party! You’ve got a lot of catching up to do & not alot of time to do it. :o) There are so many blogs to visit & friends to meet. What a pleasure! Hope you’re enjoying the party! I bet the shower after that festival felt good! Those hats the kids are wearing look so fun! Hey what fun. Womadelaide huh. Great to meet you from way down there in NZ. Come check out my party soon soon. Hope you’re having fun visiting all of the blogs at the party, it sure is a blast! I’m also fashionably late! I didn’t even HEAR about the ULB until yesterday. Womad sounds like a lot of fun! Oh wow – you know how envious I am of Womad being right there for you! I am sorry about the heat and dust though – such a pity. Still, here is hoping for a wet winter for you guys. 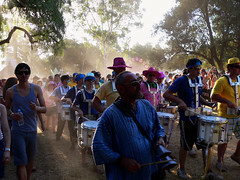 Womad sounds like great fun except for the heat and dust. Yes I hope the rain brings refreshment and green stuff. My week hasn’t been much of party but I have enjoyed browsing quite a few new blogs. Never been to Womad. Always tough to go. But, I hope to do so one day. The blog party sounds great. Will go poke around some more.